Skb File Hider is innovative application ensuring complete protection of important data files like photos, videos, music or any other files. Skb File Hider is password protected so that no one else except the phone owner can ever see the data contents without knowing the password and would not even know that there are some data or files inside which are in fact, hidden. 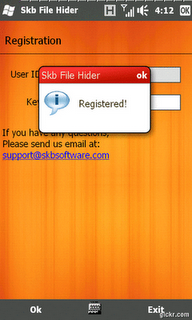 Skb File Hider is smartest ever way to provide safety to your private information. • Completely New Finder Friendly File Explorer. • File Explorer in form of Tree View. • Keeps user’s Private or Confidential Information Secure and avoids it from being used by someone Else. • Frees the User from the Threat of Theft as Full Protection of Data from being misused is ensured. • Application makes it Harder for someone to Spy on your Phone. • No One (except User) will come to know about the Hidden Data or that there is some Data Hidden. • The traditional way of Navigation makes it Easier to use the Application. • Blocks Casual Browsing on Phone.